It was originally suggested that we do Dave Edwards walk "Jacobs Ladder / Rushup Edge" but upon reviewing the traffic in Greater Manchester, it was thought this walk best be left for a Saturday. So I suggest Cadair Idris & Mynydd Moel, 7 miles, 3,200 ft.
Meet at the end of Tal-y-Llyn at the Minffordd car park, Ref SH732115, ready to walk at 10.30 am. 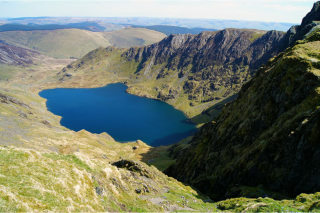 For more details of the walk look at Walking Britain Walk 1204 plus the addition of Mynydd Moel. I am sure it will be a pay & display car park.